The Renaissance Wench: Baby chicks on order!! 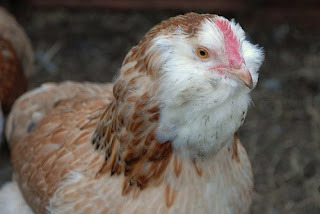 These are a French breed and have a nice feathery beard as well as laying tinted cream colored eggs. 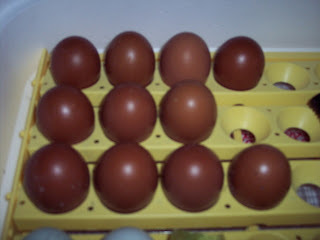 I dont have any light colored egg layers at the present so these will be pretty. 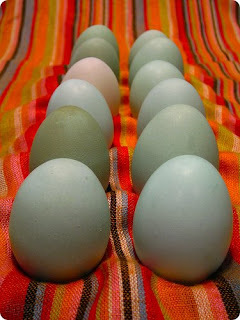 These, of course, are my personal favorites because they come in a variety of feather colors so you never know what you are going to get AND because they lay blue/green eggs. 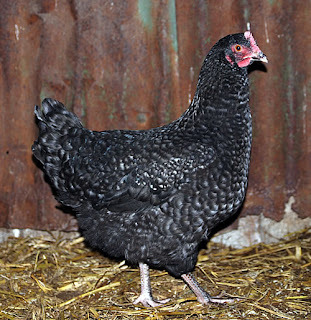 And then lastly, the Cuckoo Marans. This was my big debate this year because I do NOT like roosters. These only come "straight-run" which means they just pick up random ones and put them in the box without differentiating between females (pullets) and males (annoying rooster cockerels). 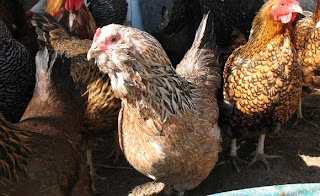 I like my chicken "girls" to just be able to lay their little eggs and go about their business without any big ugly roosters clawing them on their backs and harassing them. Unfortunately, a rooster or two is inevitable when you order straight run and I have two already. Such was my dilemma, but I caved. Why you ask? Because these eggs are the coolest!! And this chick here is the only one who's got them! I am willing to put up with a couple stupid roosters to get those super nifty chocolaty looking eggs. I cant wait!! There had better get at least 3 of 5 being pullets or Cackle Hatchery and I are going to have "words". Update! !--Chickens will be shipped on April 13.